The Martha Ingram Rivers Arts Visionary Award presented last night during An Evening of Arts Visionaries, featuring keynote address from internationally renowned artist Edgar Arceneaux. The Arts & Business Council of Greater Nashville partnered with the Belmont University Department of Art to present “An Evening of Arts Visionaries” last night in the Chapel in the Wedgewood Academic Center on Belmont University’s campus. In addition to a keynote presentation from internationally acclaimed artist Edgar Arceneaux, “An Evening of Arts Visionaries” culminated with the presentation of the Martha Rivers Ingram Arts Visionary Award to prominent father-son developers and philanthropists Steve and Jay Turner. The award, named for one of Nashville’s leading arts patrons, is intended to honor outstanding dedication to and support of the arts. This year, the award will highlight the importance of multi-generational support of the arts such as that embodied in this year’s father-son recipients. 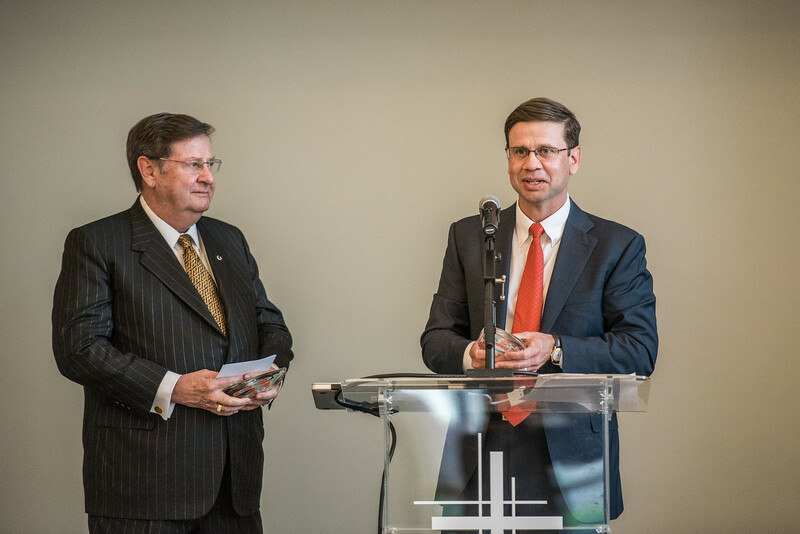 Notable Nashville citizens, Steve and Jay Turner, along with business partner Joe Barker, are the leadership team behind MarketStreet Enterprises, a privately held real estate investment and development firm that spearheaded the development The Gulch. The father-son duo have also long demonstrated their support of the arts through their involvement with the Schermerhorn Symphony Center, the Frist Center and many other arts institutions in Nashville. “An Evening of Arts Visionaries” was made possible by the Leu Endowment for the Visual Arts at Belmont, which provided the opportunity for the Belmont Department of Art to bring an artist of Arceneaux’s international caliber to campus to teach and work directly with Belmont art students. Arceneaux is the co-founder of the Watts House Project, which is a nationally recognized creative placemaking project, and a Whitney biennial artist. Arceneaux’s visit will leverage the partnership with the Arts & Business Council, a nonprofit-in-residence on Belmont’s campus, as well as relationships with leaders and artists in the Edgehill community surrounding Belmont. Arceneaux began working with local artist team leaders and Belmont art students in the fall to engage with the Edgehill neighborhood and begin conceptualizing potential community art projects. His keynote address focused on issues of civic art practice and community building. The Ingram Arts Visionary Award is sponsored by Earl Swensson Associates, a noted architecture firm known for its investment in the community. Past award recipients include Walter Knestrick (2012), Dennis C. Bottorff (2011) and Earl Swensson (2010).